Many people in Oregon likely know about Nong's Khao Man Gai, the Thai cart near SW 10th and Alder. 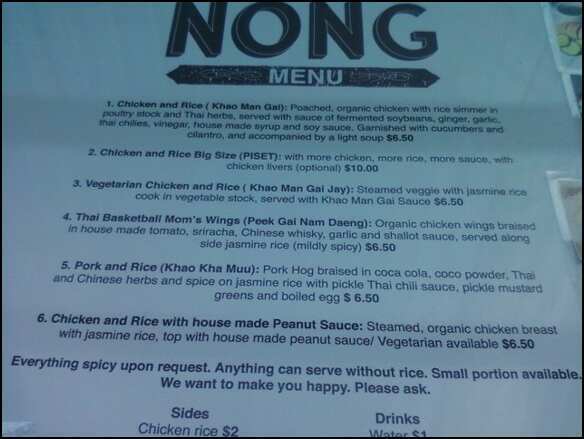 The famed chicken-and-rice dish has fed hungry customers for about two and a half years (since around May 2009). Several weeks ago, Nong Poonsukwattana opened her second cart right on the corner of SW 4th and College. This new bright yellow cart is at least twice the size of her original location, and with the new cart came some new dishes. 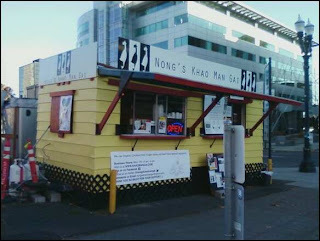 The second location on the corner of SW 4th and College! 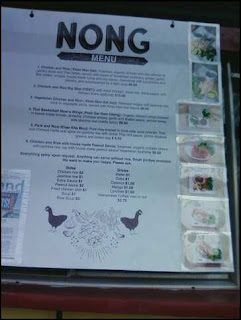 A closeup of Nong's menu at SW 4th and College! 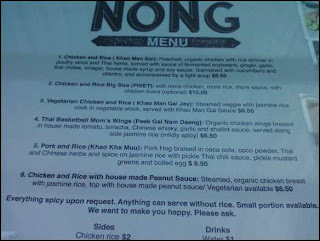 While the 10th and Alder cart will still be serving just Khao Man Gai for now, I ventured to SW 4th and College to try one of Nong's new dishes. 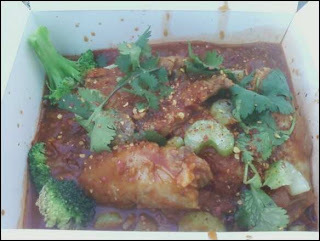 This time, it was the Thai Basketball Mom's Wings (Peek Gai Nam Daeng; $6.50). Organic chicken wings are braised in a house-made tomato-based sauce (tomatoes, sriracha, Chinese whiskey, garlic, and shallot). The dish is garnished with some cilantro. A scoop of Jasmine rice starts the plating, followed by about 4-5 wings. There may be some celery and broccoli in there as well. The sauce is then laced over the top. The braising process left the wings in an amazingly tender state. All I had to do was pick up the wing and put even the slightest effort on my bite. The meat and the skin came right off the bone. Unfortunately, I thought the soft chicken skin was off-putting. Now if it were crispy skin (fry the wings), then placed on top of the sauce (so the crispiness doesn't get ruined), that could be darn promising. The sauce was extremely comforting. While it added lovely flavor, it did not upstage the chicken. It was a bit sweet, and I did not catch any whiskey flavor. The sauce wasn't very spicy on its own, but one of the workers gave me some dried chili flakes to sprinkle on top (this gave the dish a bit more punch). The celery and broccoli brought refreshing flavor and texture contrasts. A nice, filling meal!